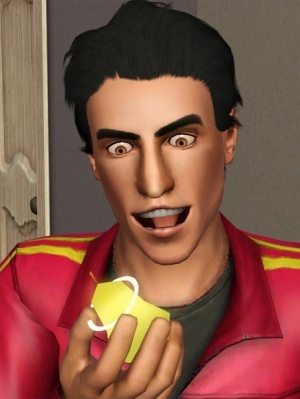 A sim about to eat a life fruit. Omnomnom. Life Fruit is one of the types of produce you can get in The Sims 3 via gardening. It requires a level 7 gardening skill to grow, and comes from special seeds. For more information on the gardening aspects of Life Fruit, please see: Sims 3 Gardening. Life Fruit has multiple uses in The Sims 3. Life Fruit is the best fertilizer for plants, both in quality and duration. While Life Fruit is highly valuable and can be sold (base price for normal quality is 25, 100 for perfect quality), it's much more valuable as fertilizer, eaten raw, or an ingredient. When eaten raw, Life Fruit will make your sim one day younger, within the current age stage. Life Fruit cannot de-age your sim (for example, from elder back to adult). Life Fruit can be made into various dishes such as pancakes, but it will not give any age reduction benefits in that form. Its main usage as an ingredient is part of Ambrosia, along with Deathfish, for a much higher age reduction benefit. This page was last modified on 9 October 2012, at 16:57.